La Chandeleur, also known as Crêpe Day, marks the halfway point between winter and spring. In France, the month of February starts with the celebration of Candlemas. It occurs on February 2nd, which is 40 days after Christmas. Many French families celebrate by preparing and eating crêpes on this day and all through the Mardi Gras season. Not only do the French eat a lot of crêpes on Chandeleur, but they also do a bit of fortune telling while making them. It is customary to hold a coin in one hand and a crêpe pan in the other and make a wish while the crêpe is flipped into the air. If you catch the crêpe in the pan, your wish is to be granted and your family will be prosperous for the rest of the year. For La Chandeleur most French households eat crêpes at dinner time. The crêpes are often round and golden, a reminder of the sun and the springtime that is soon to come. A very common food in France, crêpes are not only easy to make, but conveniently can be served any way you like. This allows families to eat exactly the crêpes they want. Today, I wanted to make savory gluten free kale crêpes with a Middle Eastern twist. 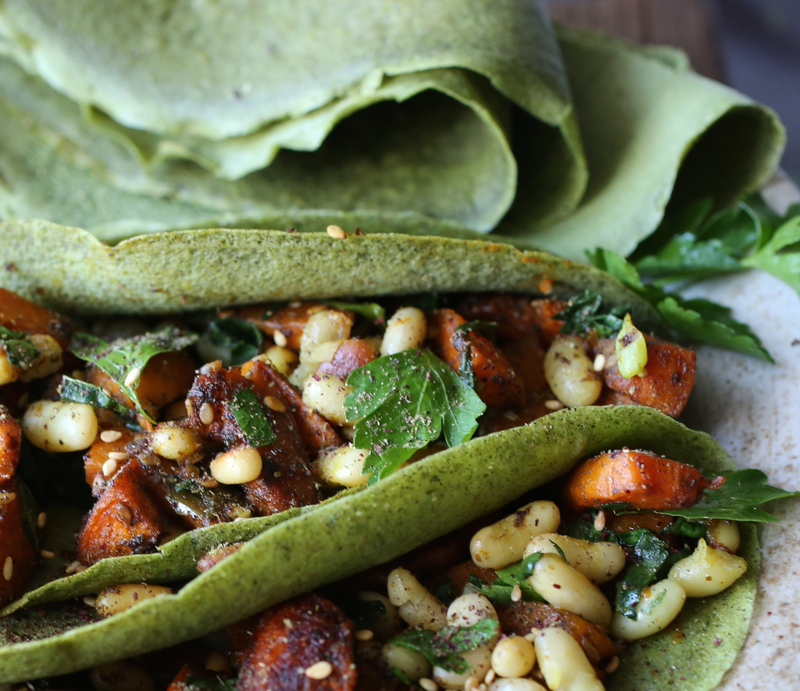 These crêpes are made with buckwheat and garbanzo bean flours and blended with kale and fresh herbs. Spinach can be used instead of kale, if you prefer. 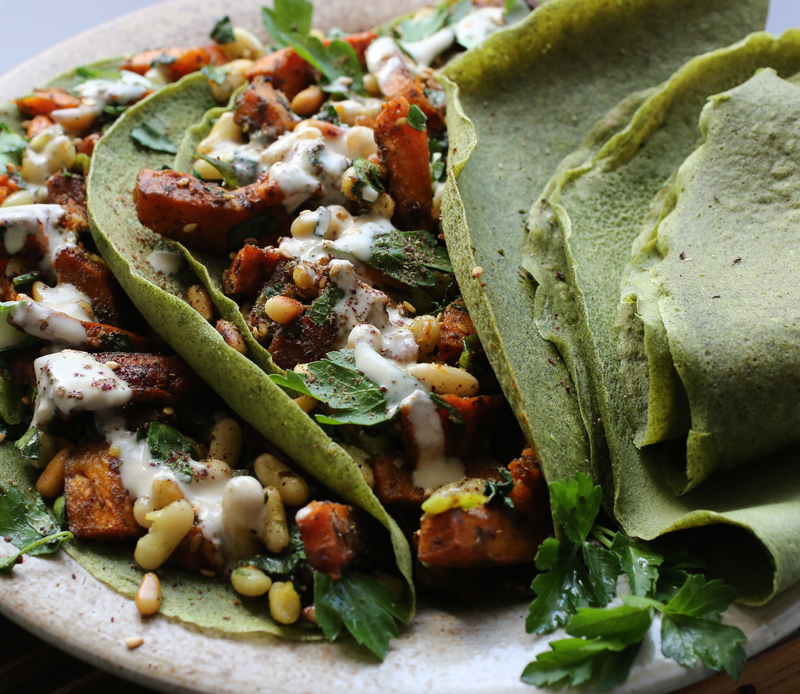 The filling is made of a heady mix of roasted squash, flageolet beans, green onions, pine nuts, parsley and seasoned with za’atar and sumac. To finish, it’s drizzled with an optional lemon-tahini dressing. For a MUCH simpler version, and still have Middle Eastern flavoring, spread the crêpes with hummus, drizzle with olive oil and sprinkle with za’atar. Fold and enjoy! I can eat them like that almost every day. Yum! For La Chandeleur, I also made gluten free crêpes without the kale and herbs in the batter. Instead I sautéed the kale with mushrooms, onions, garlic and added flageolet beans. For more on that version, see notes below. In a blender, combine 1 cup of milk with the rest of the ingredients and blend until smooth. The batter should be fairly thin. You might need to add a little more milk Cover and refrigerate at least 1 hour, or overnight. I refrigerated my batter over night. Gently stir the batter. If it seems to thick, add a little more milk. Heat a non stick skillet (6-inch-8-inch for smaller crêpes and 9-inch to 10-inch for larger crêpes) over medium heat. Coat the pan with coconut oil or butter. Lift the pan from the heat and pour about 1/4 cup of batter for a 9-inch to 10-inch crêpe (less for a smaller one) and tilt and rotate the pan to coat the surface. You should spread it thin, not thick as in an American-style pancake. Cook until almost dry on top, about 1 minute. Loosen the edges with a spatula and flip, then cook another 15 seconds, or so. Repeat with the remaining batter and stack the crêpes as they are cooked. Toss squash in olive oil with garlic, za’atar, sumac, salt and pepper. Roast until tender, 20-30 minutes. Meanwhile, heat a small skillet with olive oil, lightly pan fry flageolet beans. After about a minute, add a clove of crushed garlic, green onions, and salt. Squirt with fresh lemon juice. Transfer the squash to a large bowl, toss gently with flageolet mixture. Add chopped parsley, pine nuts, and drizzle with olive oil. Taste and adjust seasoning. Fill crêpes and sprinkle with more za’atar, sumac, and/or salt, if you like. Drizzle with dressing, if using. Notes: I also made gluten free crêpes without the kale and herbs in the batter. 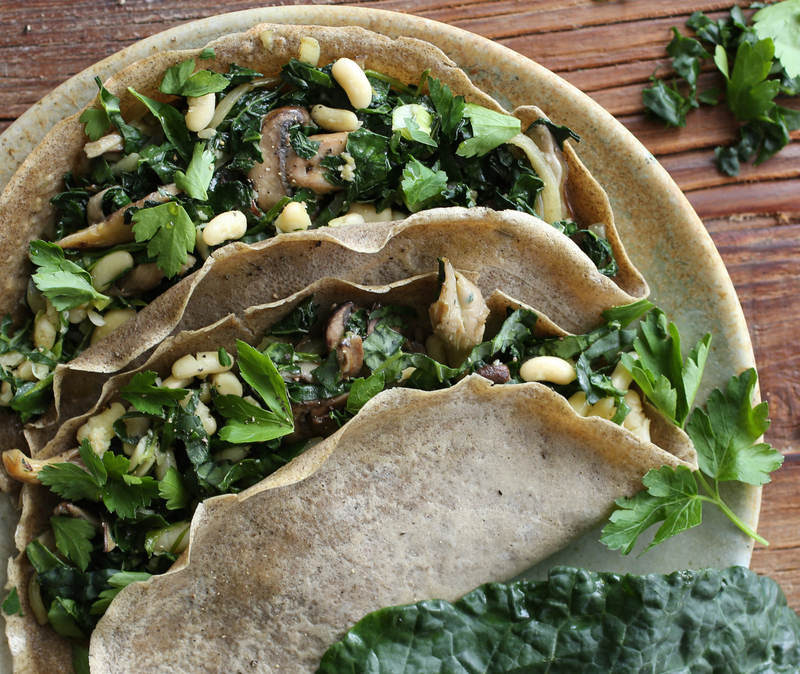 Instead I filled these crêpes with sautéed kale, mushrooms, onions, garlic and flageolet beans. To make these, follow the same recipe for crêpes above, but without the kale and herbs in the batter. The filling consists of about 8 ounces chopped mushrooms (I used a mix of shiitake, oyster and portobello), 1 cup chopped kale, 1/2 cup cooked flageolet beans, 1/4 onion, 3-4 cloves crushed garlic. Sauté all in olive oil. Season with salt and freshly ground pepper. Add about 1/4 cup chopped fresh parsley. Fill crêpes, drizzle with olive oil. I took photos later than I would have liked, hence the dried edges which curled.